Do we need a public transport architect? Sometimes later add-ons to a railway station, bus shelter or other infrastructure can detract from its function, amenity or aesthetics. Other times buildings may go unused (eg old goods sidings or kiosks) when they could do something useful, such as bicycle parking or a business. Whether it's an inconvenient entrance, an insensitively located ticket machine, a mid-platform obstacle or an errant billboard, expediency can sometimes prevail over passenger needs or built heritage. 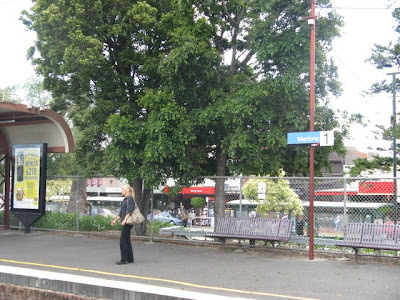 Mentone Station was identified here as a 'high amenity perception' station. It's easy to see why from the photo below. The things that make Platform 1 special include a pleasant treed outlook, visibility of people and shops. A low-profile fence, a gap in the shelter and easy access all combine to integrate the station with the surrounding community. Rather than the platform being seen as a 'fortress', 'isolated' or 'unsafe' the perception conveyed is safe and welcoming with good passive surveillance. 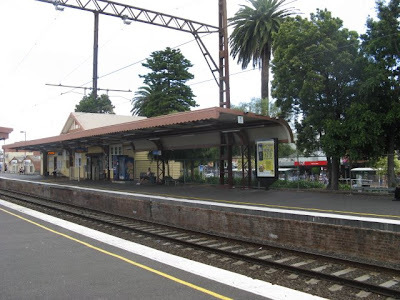 The next photos are also of Mentone, but Platform 2. The difference with Platform 1 couldn't be more stark. Outside is a carpark that is full of commuters during the day and empty at night so it is less active than the shops overlooking Platform 1. 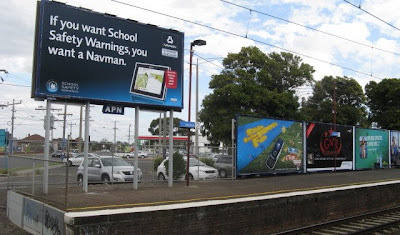 The main damage however is caused by the long line of billboards along Platform 2. This visually cuts the car park from the platform and shops and the platform from the people and traffic outside. While Mentone is a very safe suburb, the poor nighttime safety perception of an isolated carpark and unstaffed station platform still lingers in many minds and the blocked visibility makes it appreciably worse. The fix in this case is simple; remove the billboards to improve amenity and perceived safety. A previously blocked vista to shops and buses would also be opened. The example shows that good design can make a difference and that a generally well designed station can be spoiled by later add-ons. There is also the matter of competing criteria; in this case the dominant (only?) design factor in erecting the billboards appears to have been exposing waiting passengers on Platform 1 to the most advertising possible. With booming patronage, proposed 'tag-off' ticketing requirements, and the need for existing stations, platforms and entrances to carry 2 or 3 times their current passenger throughputs, we will need to rediscover the need for good station design. To cope with increasing demands, some of the expediencies put in place during the 1960s - 1990s patronage slump/stagnation may need to be reversed. A public transport architect conversant with rail operations and passenger traffic may well be a sensible investment to ensure that stations, shelters and stops are reviewed with throughput capacity and amenity maximised. In theory we have a State Architect. There is no reason why he shouldn't have input into the design of stations. It would probably be up to the DOT to get him on board though. I couldn't help but think when Myki comes online maybe it can influence things. Connex seems to have all but given up on policing tickets at suburban station gates in favour of roving gangs in carriages. Do we still need to herd passengers though one opening? Perhaps a couple of well placed validations machines and no fence at all? From a personal perspective, I couldn't agree more about getting rid of the billboards. But I also thought that they contributed badly to the "bunching up"problem on Flinders St platforms earlier this year. I don't expect it to happen too soon. There's money to be made. Anon, thanks for the reminder re the State Architect. Though without skill in rail operations or passenger movements I'm not sure what value a general position could add. Except maybe in aesthetics, but then everyone's got an opinion on that!